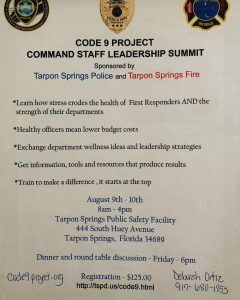 Community members, leaders, and service providers are encouraged to attend. 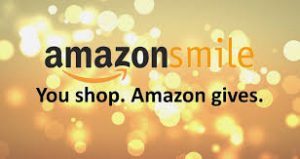 Support Peace4Communities by shopping at AmazonSmile. Use this link when shopping on Amazon to make a donation to Peace4Communities. Explore the most effective new and proven approaches to healing and growing in the wake of trauma. Whether you’re a therapist, supporting a loved one, or in the recovery process yourself—join us to learn evidence-based techniques that you can immediately put into practice. Registration Information listed on flyer! This was a long time coming – in fact, the vision for it arose a couple of years ago, but the timing was right on January 13th when everything aligned for us to come together! Peace4Tarpon, Peace4Gainesville, Peace4Crawford County (PA) and Peace4The Big Bend (Florida) hosted the first “Peace4” Communities Gathering at St. Petersburg College Tarpon Springs Campus. 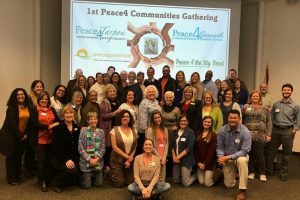 Joining us were folks from around the state – who are passionate about Trauma Informed Care, Resilience, and I’m guessing were just plain curious to experience what the Peace4 communities are all about. The day was powerful and to me, almost magical. There was an energy that radiated throughout the room as great leaders from all over gave powerful presentations promoting world-wide trauma awareness, sensitivity and healing. As each agency presented their initiatives and success stories from their areas, the creativity and inspiration was infectious. Each person left that day with a sense of empowerment and motivation to keep the trauma informed care movement going and growing stronger. “Steal shamelessly and share relentlessly” was a quote used throughout the day as there was no ownership or proprietary rights over thoughts and ideas. The more we share information, the better outcomes for everyone. 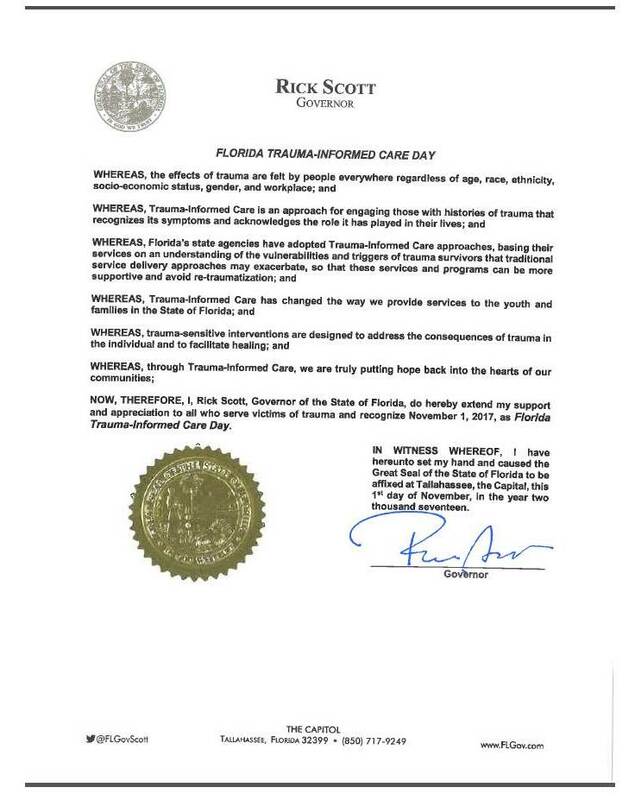 The Peace4Communities gathering was an amazing success and brought us one step closer to our goal of becoming Peace4Florida, the first ever trauma informed state! The statistics on the number of children who experience sexual abuse is alarming. 1 in 4 girls and 1 in 6 boys report unwanted sexual contact before the age of 18. However, due to the fact that it is extremely underreported, more likely statistics are 1 in 2 girls and 1 in 3 boys. While these numbers are horrifying, there are precautions parents and caregivers can take to reduce the risk of their child experiencing this all too common ACE. Many people associate sexual abuse with “stranger danger” and a “creepy guy” lurking in the bushes. However, this is not usually the case. 93% of children who experience sexual abuse know and trust their abuser, as do their parents. Know the red flag behavior: Child molesters use specific behaviors à Learn them! Some of the red flag behaviors identified include adults who want alone time with a child, having secrets with children, abuse of power, position and privilege, grooming, blurring roles and sexualizing children. Speaking up and teaching children it is okay to speak up is paramount. Talking with children about healthy sexuality is a life-long conversation, including teaching them to respect and honor personal boundaries. Child sexual abuse is a traumatic event that can have lasting effects on individuals. 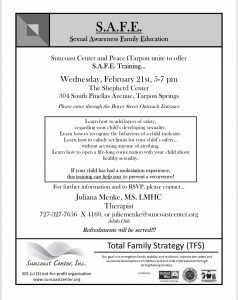 This training is meant to help educate individuals and reduce the risk to your child. H. Res. 443 Recognizing the Importance and Effectiveness of Trauma-Informed Care PASSES UNANIMOUSLY! (2) encourages the use and practice of trauma-informed care within the Federal Government, its agencies, and the United States Congress. Congressman Gallagher and Congressman Davis for their leadership to facilitate this big step forward. 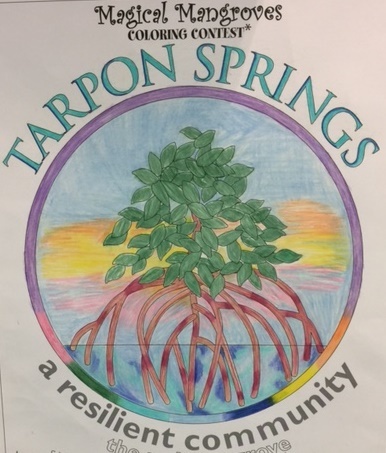 Peace4Tarpon and the City of Tarpon Springs sponsored the Magical Mangroves Coloring Contest for children between the ages of 4-12 to scratch their creative itch, learn a little bit about our magical, native Red Mangroves and win awesome prizes! 151 children submitted beautifully colored and bedazzled posters which were on display at the Tarpon Springs Public Library. The amazing judges – Tarpon Springs Mayor Chris Alahouzos, Ann Larsen – Director of the Leepa-Rattner Museum of Art, and Tarpon Springs artist Christopher Still had a difficult time selecting winners! Winners were recognized and received their prizes at City Hall during the City Commission meeting – which was live streamed. Visit our Facebook page to see all current events, and “like” us to connect with our news feed. Together as a community, we are stronger!